Two Zimbabwean journalists from the state-owned Sunday Mail and Herald newspapers—Munyaradzi Huni and Caesar Zvayi—have been placed on the European Union's sanctions list. The two, alongside other perceived supporters of the Mugabe regime, will have their assets frozen and will not be allowed into European Union territory ("Journalists added to EU sanctions list," SW Radio Africa, July 23). The move is shocking in that it is a blatant attempt at mind control and is clearly aimed at muzzling voices other than those that are seen and heard to be supporting Morgan Tsvangirai of the Movement for Democratic Change. I say this because, early this month, French Foreign Minister Bernard Kouchner stated that the European Union would not recognize any government in Zimbabwe other than a government led by Tsvangirai ("EU wants Tsvangirai to head Zimbabwe govt," Reuters, July 1). Also, Zvayi no longer works for the Sunday Mail and I doubt that Huni, like the bulk of those working within Zimbabwe's state-owned media, can afford to travel to any part of the European Union. It is also highly unlikely that any of them have assets in the European Union. In placing these two journalists on the sanctions list, the European Union is actually trying to instill fear and create a psychological block on all writers and commentators who have an interest in Zimbabwe and who have an alternative take on what is happening there. This is further evidenced by the fact that, currently, among other things, Peter Mavhunga—a court probation officer and part-time newspaper columnist who has been living and working in Britain for the past 30 years—is now being subjected to a witch hunt by British authorities because he writes for the Zimbabwean state-owned Herald newspaper ("UK bars Zim DJs," Journalism.co.za, July 15). While I believe that a solution needs to be found to the country's political and economic crisis, I do not believe that threatening, harassing, and intimidating writers in this manner will do anything to resolve the crisis. Behaviors like these are an abhorrent form of censorship and are an attack on the freedoms of speech, thought, and association. They are no different from the treatment repressive regimes all over the world routinely mete out on writers they see as expressing views that deviate from—or threaten—the regimes' interests. In placing Huni and Zvayi on its sanctions list, the European Union is, in effect, threatening not only journalists who work for the state-owned media in Zimbabwe but all people who have an interest in the future of the country, telling them, "If you are seen to be supporting anyone other than Tsvangirai, we will make life uncomfortable for you." The European Union, like the United States, tries to justify this position by arguing that because Tsvangirai "won" the March 29 elections, he should, therefore, lead the country. In all likelihood, the European Union is aware that this argument is deeply flawed and is now waging psychological warfare on writers and political commentators in an attempt to manipulate what they write and say about Tsvangirai. I say the European Union's position on Tsvangirai is flawed because it is not and should not be up to the European Union to decide who should have what position in the Zimbabwean government. That decision should be left to the people of Zimbabwe. In addition to this, the European Union's position is flawed because it is based on the embellishment that Morgan Tsvangirai won the March 29 elections. The truth of the matter is that Tsvangirai got 47.9 percent of the votes and this fell short of the 50 percent (plus one) that both the M.D.C. and ZANU-PF had agreed were needed in order to determine who should lead the country. Based on the results of the March 29 elections, it can actually be argued that the majority of the people in Zimbabwe—52.1 percent—do not have confidence in Tsvangirai as a leader. Had Tsvangirai taken part in the June 27 presidential runoff and had he received 50 percent plus of the votes, then yes, he would have had the right to lead the country. 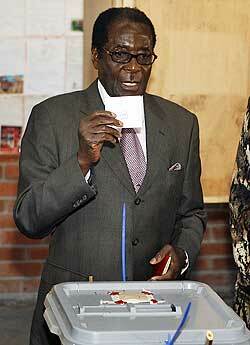 But because he unilaterally pulled out of the elections, he left President Robert Mugabe as the sole candidate. And, because Mugabe was the sole contestant in the June 27 elections, he won, and is, therefore, the legitimate leader of Zimbabwe. Instead of threatening writers and political commentators, if the European Union truly wants a feasible solution to the crisis in Zimbabwe, it should support the mediation efforts that are currently being overseen by South African President Thabo Mbeki. View the Worldpress Desk’s profile for Ambrose Musiyiwa.